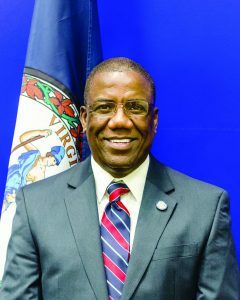 State Delegate Lionell Spruill has wasted no time in announcing his intentions to run for State Senator Kenneth Alexander’s seat, now that Alexander has been elected mayor of Norfolk. Spruill will run for Senate District 5 which covers parts of Chesapeake, where he lives, and the City of Norfolk. Spruill said his experience in the Virginia General Assembly – sitting on important committees, working on legislation and funding issues facing Norfolk and the region – is the reason why voters should choose him in the upcoming election to replace Alexander. It is unclear if other Democrats or Republicans will join Spruill in the effort to claim the Senate seat being vacated by Mayor-Elect Alexander. It is considered one of the most attractive in the region, and was held by the late Sen. Yvonne Miller before Alexander replaced her. Spruill told the Guide that he has endorsed former Chesapeake Council member Cliff Hayes if he chooses runs for his House seat.